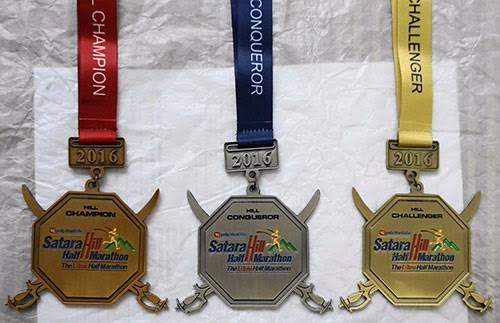 Every Half Marathon Finisher @ SHHM gets a Finisher’s Medal and an online certificate with the Finishing timing. The above criteria apply to both Male and Female runners, across all age groups. IMPORTANT NOTE : The GUN TIME [ NOT CHIP TIME ] will be considered for the allocation of the medals according to the above mentioned cutoffs, which means that the Runner’s time starts right after the starting gun goes off and stops when he/she crosses the finish line. 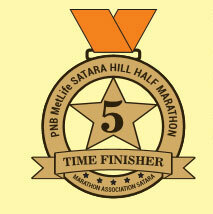 This special medal has been dedicated to our very own Mr Shankar Natha Pawar, a 96 year old Veteran Runner from Satara. He is an inspiration to all runners & we are proud to dedicate this medal to his legacy.